Start time: 7:10 p.m. TV/Radio: NESN / WEEI. Follow along as our team at Fenway Park provides analysis and insight throughout Game 2 of Red Sox-Yankees. It's only been 19 innings. But the defensive upgrade at second base for the Red Sox is considerable with Ian Kinsler. Surprisingly, the double play grounder was Porcello's first in two months (last on June 3) and his 6th of the year. Porcello hit Gardner and Severino buzzes Betts. Benches are warned and Cora is tossed for the first time as manager. Alex Cora gets his first ejection as Red Sox manager for arguing the warnings given to both teams after Severino goes up and in to Betts with 95 mph with the first pitch of the game. And Cora is livid. Cora was ripped. Phil Cuzzi has to hold him back from home plate ump Adam Hamari. Hamari was too quick that warning. Severino evened the score and move on. Steve Pearce with a laser out to LF. Just a rocket. 2-0 and Fenway is alive. The Legend of Steve Pearce will be a strange chapter of the 2018 Red Sox season. Pearce follows Benintendi's double by demolishing a 1-0 fastball over the Green Monster, his fourth homer against the Yankees in 2 days. #RedSox usually platoon at 1B. But Steve Pearce stayed in the lineup against the RHP after the 3 HRs on Thursday. Alex Cora: "It’s hard to sit a guy who hit three home runs. There’s no stats, no nothing. He has to play. What he did [Thursday] there’s no way." Kinsler with his second steal in as many games and the Red Sox' 5th steal in 2 contests. With 4 homers in the last 2 games, Pearce has tied the record for most homers by a Red Sox in a single series against the Yankees. #RedSox 13 x 13 in stolen bases vs. #Yankees this season, 5 x 5 in this series. That last one by Kinsler led to a run. On a night the Yankees need some innings from their starter, 33-pitch first inning for Severino. He has allowed 19 ER in his last 15.1 IP. There is some stuff going on here. Mookie Betts might be playing second. Kinsler is out. Pearce is in RF and Moreland at 1B. Kinsler slowed down as he approached the plate, so perhaps he is injured. 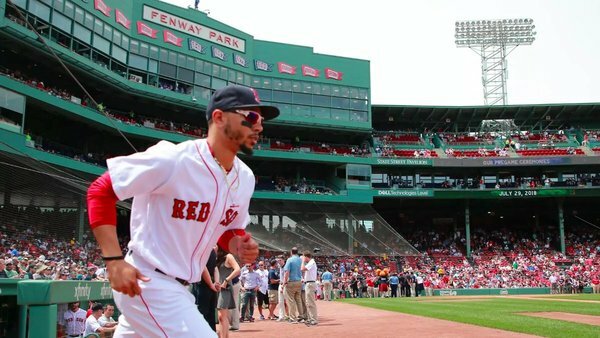 Mookie Betts is playing second base for the first time since 2014. Kinsler left the game, forcing that move; Pearce moved from first to right, while Moreland came into the game to play first. The only infielder on the bench is Bogaerts, who is dealing with the injured hand. Mookie Betts is playing 2B for the first time since 2014. Worth recalling that he was widely projected as a Gold Glove-caliber 2B (shocker) coming up through the minors. He still takes infield grounders, though usually from the left side, as a means of maintaining quick release. Betts came up as a 2B and played there in the majors in 2014. He also takes grounders in the infield several times a week just for kicks. So, enjoying the game so far? Enough going on for you? Ian Kinsler left the game with left hamstring tightness. So Devers, Swihart and Kinsler with hamstring issues. Pearce played 2B as recently as 2016 and he's been taking grounders there this year. Given vastness of Fenway RF, one wonders why the Sox opted to put Betts in the infield and Pearce in RF, particularly given that Porcello isn't a particularly groundball-heavy pitcher anymore. First time through the Yankees lineup, Porcello allowed one run on one hit (a Miguel Andujar solo homer) while throwing 24 of 30 pitches (80%) for strikes. He also hit a batter. For what it's worth in light of Kinsler injury: Tzu-Wei Lin isn't playing tonight in Pawtucket. RHP Mike Shawaryn is, making his PawSox debut. He'd gone 9-up/9-down with 4 Ks before allowing a leadoff single in the 4th. Another Pawtucket aside: Tyler Austin just hit against the PawSox for Rochester (Twins AAA affiliate). He walked. No word of benches emptying. One night after the Red Sox got into the Yankees bullpen in the 4th inning, Severino is at 67 pitches through 3 innings. This is a very different start from his last vs Boston, when he needed 99 pitches for 6.2 innings. Porcello is through 4 innings having thrown just 43 pitches, 34 (79 percent) for strikes. Bradley caught three lineouts to center.